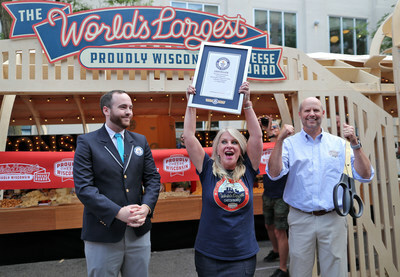 MADISON, Wis., Aug. 2, 2018 /PRNewswire/ -- Wisconsin makes un-brie-lievable history by creating the World's Largest Cheeseboard, officially setting a new GUINNESS WORLD RECORDS® title. The show stopper took over an entire street in downtown Madison, displaying over two tons of Wisconsin's finest cheeses from across the state, topping the previous European record holder by over 1,000 pounds! 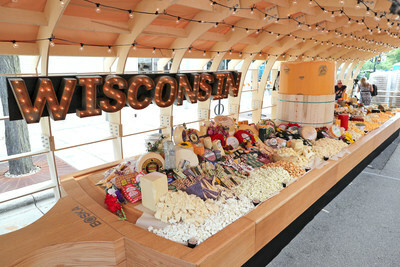 Spanning 35 feet long and 7 feet wide, the custom board was officially adorned with 4,437 pounds and 145 different varieties, types and styles of Wisconsin's unique specialty and artisan cheeses- including national and international award-winners. An enormous Henning's 2,000 pound mammoth cheddar wheel was the grand centerpiece, surrounded by blue-veined and cave aged cheddars to fresh feta, squeaky curds and hand-rubbed wheels to pungent Brick and the 2017 U.S. Cheese Champion, Sartori Black Pepper BellaVitano®, to name just a few. "We wanted to showcase the amazing breadth of the award winning cheeses in Wisconsin and we thought- what better way to do that than to create the world's largest cheeseboard," says Suzanne Fanning, Dairy Farmers of Wisconsin VP of Marketing Communications. "Wisconsin's licensed cheesemakers put the art in artisan, drawing from their rich European heritage, cheese making traditions and impressive innovations, and we're thrilled to share their masterful creations with the world in a unique and fun way." The gigantic cheeseboard was custom made to fit inside a life-size, digitally fabricated barn, using CNC technology—a computerized process that's a cross between woodcutting and 3-D printing—by Better Block Foundation, a nonprofit that uses urban design to foster community. The ultimate cheese lover's fantasy was a true team effort- taking over 60 people to prep, transport, house, style and weigh all of the cheeses. Following the official judging ceremony by a GUINNESS WORLD RECORDS adjudicator, a crowd of over 45,000 enamored attendees got to check out the mouth-watering board and the first 2,000 guests in line, received a curated cheese plate to-go. In addition, no cheese went to waste. Spectators entered a raffle to win full wheels of cheese with 100% of the proceeds going to the Great American Milk Drive and the remaining cheese was donated to the Second Harvest Foodbank of Southern Wisconsin, both benefiting families in need. Wisconsin produces 48 percent of the specialty cheese in the U.S. and currently holds the title for 2017 U.S. Champion Cheese. For more information, visit WisconsinCheese.com or connect on Facebook. About Dairy Farmers of Wisconsin: Funded by Wisconsin dairy farmers, DFW is a non-profit organization that focuses on marketing and promoting Wisconsin's world-class dairy products. For more information, visit our website at wisconsindairy.org.